Last time I did discuss with you about two sunblock products, one from L’Occitane En Provence (Reine Blanche Illuminating UV Shield SPF 50) and another from Innisfree (Daily UV Protection Cream No Sebum SPF35 PA+++). 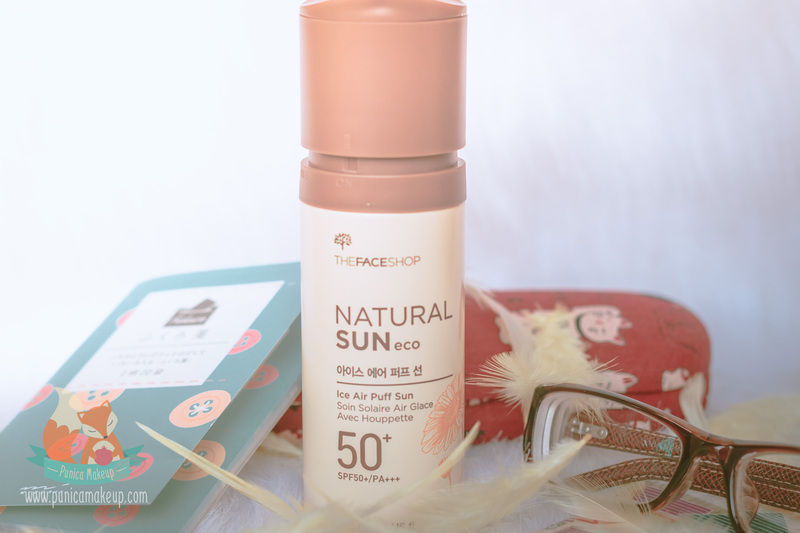 This post today I want to continue with the sunscreen topic and it’s gonna be The Face Shop – Natural Sun Eco Ice Air Puff Sun SPF50+ PA+++. 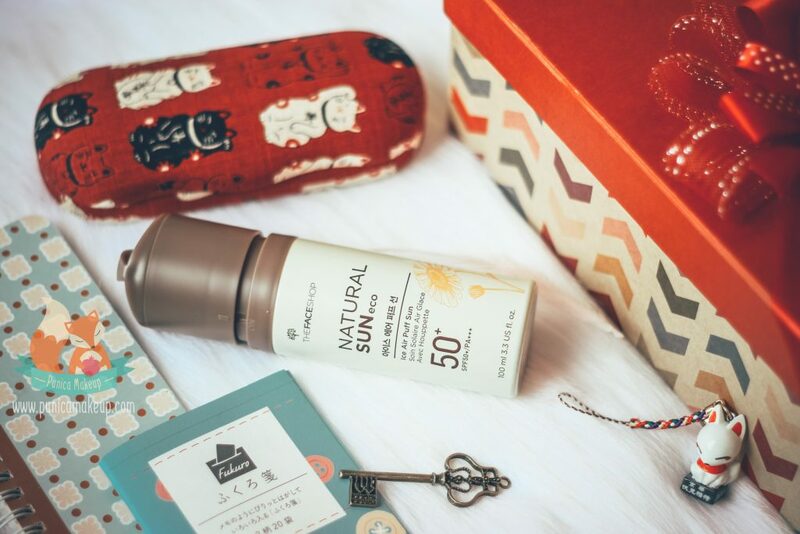 I hope girls won’t feel bored why I keep talking about sunblock and sunscreen products because I really want you all to get ideas of how to pick “the best suit” for your skin under sunlight. 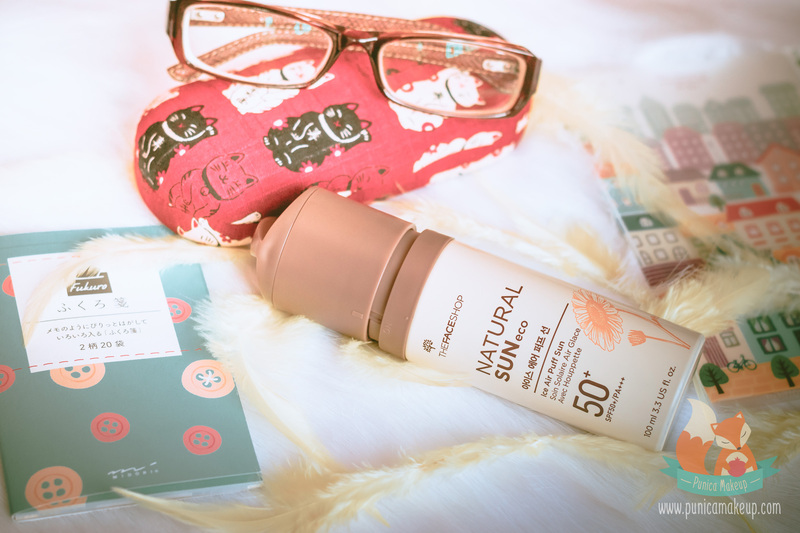 The Face Shop released lots of UV protection lines with ingredients from sunflower seed extract. Currently, the company has put many promotion efforts to encourage buyers to switch to its’ new idea, the name I did mention above and no change in ingredients. But, its’ cost is relatively higher than previous versions’ for a new-concept sun care under spray type to instantly deliver -5C cooling effect upon application. It sounds like an amazing optimization, right! This is aimed at “5 in 1” (UV Block, cooling, foundation, anti – wrinkle and whitening) and flawless complexion finish. The description made me find it interesting so I bought it. I have experienced the product for 4 months and finally, I decided not to buy it anymore. I won’t deny that it’s fabulous for some cushion effects, a strong shield against damages of UV rays (PA+++), brightening skin tone, moisturizing and somehow smoothing application. A big problem I have with is out of control excess sebum as using it. The sunblock may dismiss the pore care element. At first few minute tapping upon my skin, I’m really impressed with a cooling sensation and a natural sheen; but it’s just shortly happening. About 1 hour, I have to struggle with greasy feeling and noticeably strange glow upon T-zone and even, my cheeks. Then, I gotta keep myself to bring some oil control films when going to work or hanging out with friends. I think it’s not really something for oily and combination skin type to have a daily wearing coat against the UV rays. After few months, pimples and acnes seem to be more and more so I gotta say goodbye to it. Additionally, it seems not to spread evenly on my skin because sometimes, when applying upon areas around my eyes, it leaves weird folding marks on the eyelids. Moving on to the packaging, it simply looks like a small graffiti bottle. Just kidding! It’s eco-friendly looking, brown and mild yellow with clear printing information and sunflower image. The whole container is designed for optimizing users’ convenience. When pumping the sun spray out, it’s gonna come directly into a puff that is attached below the container lid. It has smart design for managing efficiently the pumping amount and moreover, it seems to be convenient for “rushing” girls. Ok, sum up the things; I’m afraid that the sunblock may get an average mark, 6 out of 10. I don’t want to be mean with it but; I think it’s not a sunblock which is gonna be fine for every skin types. This mark is just for the warning, girls. Or, it possibly works for you. Thank you so much, I hope you enjoy with this review. I really want to know how you feel about the product if you did try it. Do you agree with me or not? Can’t wait to see your opinions!